Medical Bedside Emergency Service Supply Carts, Hospital Procedure Medication Code Crash Carts, Anesthesia Treatment Cart at Global Industrial. General Purpose Medical Carts Organize And Store Essential Medical Supplies In Hospitals, Nursing Homes, Doctors' Offices And Other Healthcare Facilities. General Purpose Medical Carts are made from high density polyethylene, ABS plastic, steel or aluminum for long lasting durability and chemical resistance. Casters and built-in handles allow smooth mobility and steering between patient rooms. Locking systems secure medications, testing kits and other patient supplies. Medical service carts are available in a variety of sizes and configurations from top brands Buddy, Detecto, TrippNT and Waterloo Healthcare. 20 color finishes listed. Dimensions vary per model. 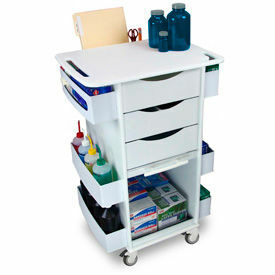 Bedside Medical Carts Allow Easy Access To Medical Supplies In Hospitals, Nursing Homes, School Infirmaries And More. 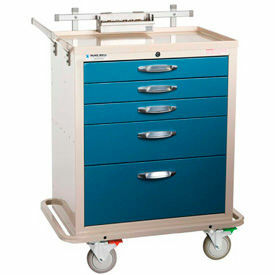 Bedside Medical Carts provide safe and convenient storage for medical tools and substances. Carts are made of high density polyethylene, ABS, PETG and steel to provide long lasting durability. Carts are available in a variety of sizes and configurations. Shelf quantities are 1, 2 and 6 Side-Mounted. Drawer quantities are 3, 4, 5 and 6. Available in 14 color finishes. Dimensions vary. Medical Lab Carts Move Medical Supplies Around Hospitals, Nursing Homes, Doctors' Offices, Clinics And More. Medical Lab Carts are made from high density polyethylene or acrylic for long lasting durability and chemical resistance. Casters and built-in handles allow smooth mobility and steering between patient rooms. Locking systems secure medications, testing kits and other medical supplies. Low-profile designs allow carts to be stored out of the way when not needed. 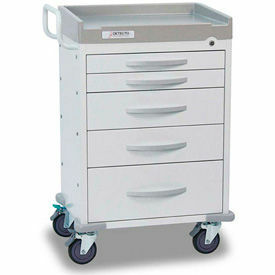 Medical service carts are available in a variety of sizes and configurations to fit specific medical material handling. More than 20 colors listed. Dimensions vary per model. Emergency Medical Carts Allow Easy Access To Medical Necessities In Hospitals, Medical Practices, Nursing Homes And More. 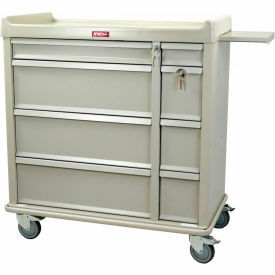 Emergency Medical Carts allow safe and convenient storage for medical tools and substances. Casters allow smooth mobility and steering. Shelf quantities are 1, 1 Drop Shelf, 1 Interior, 2 and 6 Side Mounted. Drawer quantities are 3, 4, 5 and 6. Available in 14 colors and a variety of sizes and configurations. 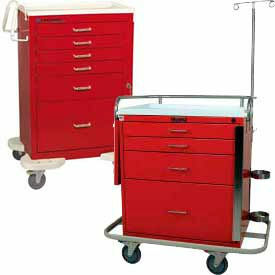 Anesthesia Medical Carts Safely Store Medications, Tools And Other Supplies In Hospitals, Private Practices And More. Anesthesia Medical Carts allow safe and convenient storage for anesthesia tools and substances. Medical Carts are made of steel, aluminum, high density polyethylene, ABS and PETG to provide long lasting durability. Casters allow smooth mobility and steering. Drawer quantiites are 3, 4, 5 and 6. Carts are available in a variety of sizes and configurations with different options for locking mechanisms. Available in 20 colors. Dimensions vary. Nexel® Chrome Catheter Procedure Carts Provide Content Storage and Organization For Medical, Laboratory, Maintenance, and Other Related Applications. The open wire design improves content visibility allowing convenient and efficient inventory tracking. The 5" polyurethane swivel casters (2 with brakes) allow ergonomic unit mobility, maneuverability, and accidental roll prevention. The steel construction provides strength and impact resistance for years of reliable service. Optional accessories include shelves, hooks, baskets, bins, and bin markers. 1200 lbs. maximum weight capacity. Chrome color finish. Dimensions and shelf quantities vary per model. Medical Treatment Carts Are Used For Use In Hospitals, Private Medical Practices, Nursing Homes, School Infirmaries And More. Medical Treatment Carts are designed for storing, organizing and transporting medical supplies. Carts are available in a variety of sizes and configurations, with different options for drawer quantities, locking systems and colors. Medical Treatment Carts are offered from several trusted brand names. 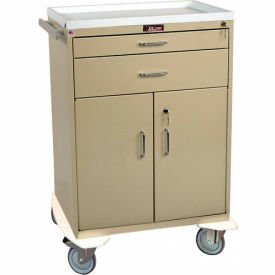 Isolation Hospital Carts Offer Convenient Access To Infection Prevention And Control Supplies Outside Patient Rooms. 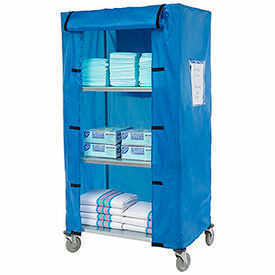 Isolation Hospital Carts allow safe storage of supplies that limit pathogen transmission in hospitals. Carts are made of aluminum, high density polyehtlyene, ABS, PETG and steel to provide long lasting durablity. Casters allow smooth mobility and steering. Carts are available in a variety of sizes and configurations with different options for locking systems. Drawer quantities are 3, 4, 5 and 6. Available in 13 colors. Dimensions vary. Stainless Steel Mobile Medical Equipment Carts Provide Convenient Storage And Writing Surfaces For Hospitals, Doctor's Offices, School Infirmaries And More. 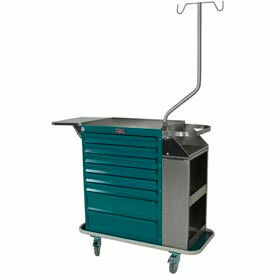 Mobile Medical Equipment Carts are made using stainless steel for lasting durability and easy cleaning. All-swivel rubber casters allow easy maneuverability. 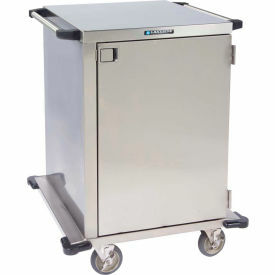 Stainless Steel Utility Carts with drawers offer protective storage for delicate or sterilized equipment. Available load capacities are 300 and 500 lbs. Shelf quantities are 2 and 3. Dimensions vary per model. 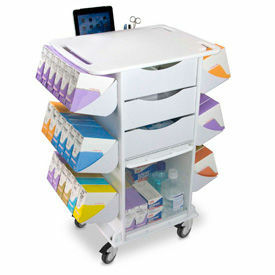 Medication Carts Safely Deliver Medications To Patient Bedsides. 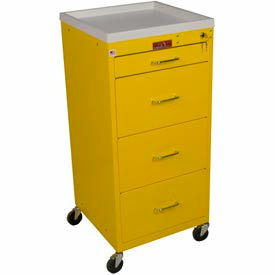 Medication Carts are solidly built for long lasting durability and reliable service. 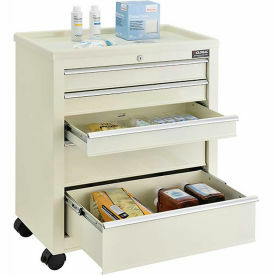 Medical service carts are available with a variety of drawer, shelf and bin configurations to store punch cards, liquids and other medications and supplies. Push handle and casters maneuver medication carts between patient rooms and supply cabinet for restocking. Select medical supply carts include a narcotics drawer and lock for safe storage of controlled substances. Colors include Bahama Sea Teal, Beige, Global Blue, Hammertone Blue, Hammertone Green, Light Gray, Navy Blue, Red, Sand, White and Yellow. Dimensions vary per model. Linen Service Carts Are Used For Hotels, Hospitals, Nursing Homes And More. 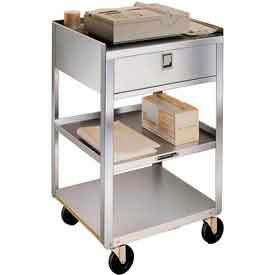 Linen Service Carts are made using stainless steel for lasting durability and easy cleaning. All-welded build eliminates nuts and bolts for a stronger overall structure. Compact size allows for easy maneuverability. Bumpers on legs and handles protect walls and furniture from marring. Available with or without Nylon Cart Cover. Choose from 2 sizes. MedStorMax® Intraocular Lens Mobile Storage Carts Are Used For Storage Of Intraocular Lenses And Other Medical Or Surgical Supplies. MedStorMax® Intraocular Lens Mobile Storage Carts are made of solid steel construction for long lasting durability and dependability. Compatible with multiple brands and sizes of IOL boxes. Six pull-out drawer shelves with adjustable dividers are used for medical supplies used in surgery centers and operating rooms. Double doors with plexi-glass inserts open 180° and allow for outside visibility of contents. Feature removable plastic tops, integrated push handles and full wrap-around vinyl padded bumpers. Five inch casters provide easy mobility. 43-2/5 inch length, 55-12 inch height cabinets are available in 924 or 1260 lens capacities with 21-1/2 or 30-3/4 inch widths respectively. Color finishes are Beige, HammerTone Blue, HammerTone Green, Light Gray, Navy Blue, Red, Sand and Yellow. Ship fully assembled. Stainless Steel Case Carts Are For Use In Hospitals, Private Medical Practices, Nursing Homes, School Infirmaries, Clinics, Operating Rooms And More. Stainless Steel Case Carts have a stainless steel construction for long lasting durability and strength. Designed for storing, organizing and transporting medical supplies and instruments. Casters (wheels) provide easy mobility and smooth rolling for confident use. Locking latch ensures added security and corrosion resistant construction minimizes wear. Choose from many types of Carts to fit the job at hand. Available with different shelf and door styles for increased versatility. Dimensions and colors vary per model. MRI Lab Carts Are Used For Hospitals, Medical Centers, And Other Healthcare Faciltiies. 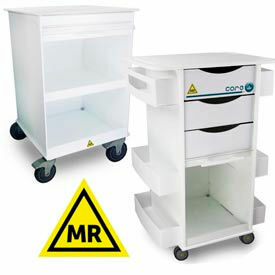 The MRI Lab Cart is made of non-reactive high density polyethylene and ABS for long lasting durability. Safe, non-ferrous carts sort, store, organize, lock and transport supplies. 3 full extension drawers, shelves and bulk storage features. Document and tool holder snaps on back. Four non-marking rubber casters provide easy maneuverability. The small footprint Core DX provides easy storage. 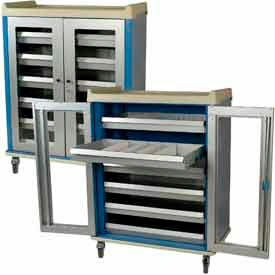 Built in handle has three full extension drawers, six side compartments and two with dispensing slots. Includes large bulk storage area with locking sliding, clear, PETG door secures items. Available with shelf quantities 4 (Side Mounted), 1 (Interior), 1 (Interior), 6 (Side Mounted), 1 (Interior), and 2 (Interior). Dimensions vary. Harloff Orthopedic Cast And Splint Carts Are Used For Use In Hospitals, Private Medical Practices, Nursing Homes, School Infirmaries, Clinics, Operating Rooms And More. Harloff Orthopedic Cast And Splint Carts have a steel construction for long lasting durability and strength. Designed for storing, organizing and transporting medical supplies, particularly for the treatment of strains, sprains and fractures. Casters (wheels) provide easy mobility and smooth rolling for confident use. Features 8 Shelves and 1 Drop Shelf for maximum storage. Choose from Cast And Splint Carts or Security Cast And Splint Carts with a key lock for increased security. Includes stainless steel folding shelf, side storage cabinet, towel bar, 24 in. stainless steel ruler (mounted on top of cart), swivel tourniquet/pump pole and a scissors cable. Available in Beige, Hammertone Blue, Hammertone Green, Light Gray, Navy Blue, Red, Sand, Stainless Steel and Yellow. Suture Carts Organize, Store And Transport Needed Medical Supplies In Clinics, Urgent Care Facilities, Hospitals, Physicians'' Offices And More. Suture Carts are made from high density polyethylene for lasting durability and chemical resistance. Various drawer, shelf and cabinet combinations store sutures, bottles, sterile kits and more medical supplies in one easy to access location. Casters allow smooth mobility and steering between exam rooms. 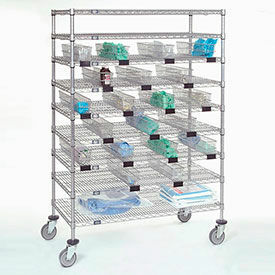 6, 8 or 10-shelf carts available to meet medical material handling needs. Color finishes are White, White/Black, White Red and White/Blue. Dimensions vary per model.